The 99ft monohull Virgin Money (ex-Speedboat) set sail this morning on its cross-Atlantic challenge. Richard Branson, his children Holly (26) and Sam (23) and the Team Origin crew – including Mike Sanderson and Olympic Gold medallist Ben Ainslie – aim to break the world record of 6 days 17 hours, 39 minutes and 52 seconds. Virgin Money set sail from New York and passed the official start line at Ambrose Lighthouse at 04:00 EST or 09:00 BST today (22 October). The yacht must make Lizard Point, the most South Westerly point of the UK, no later than 21:39.52 EST, or 01:39.52 local time, on 28 October to break the record. 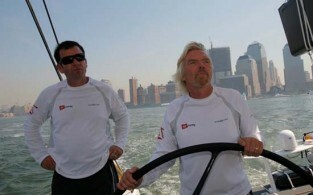 The yacht Virgin Money, which can reach speeds of up to 45 knots, contains a crew of 25. The crew members will work in four hour shifts during the challenge in an attempt to break the record. Richard, Holly, Sam and crew will be posting regular blogs charting their progress during the challenge as they attempt to sail into the record books. Although the boat is power assisted, the crew aim to break the faster non-power assisted record of 6 days, 17 hours, 52 minutes and 39 seconds, set by the Mari Cha IV in 2003, to take the title as undisputed king of the Atlantic waves. ICAP Leopard currently holds the power assisted Cross-Atlantic record.